Our camp was only built in 2008 so the installations are completely new and in good condition. All the constructions have been made following the traditional methods of the indigenous communities with thatched roofs; the idea is to preserve the indigenous culture and not intrude on the jungle. Because there is lot of space between the different buildings in our EcoCamp, helping to provide you with a more private experience, all the huts are connected by paths and are indicated with clear and simple signs, ensuring that it's impossible to get lost inside the camp. We don’t use mosquito nets (except on the beds) because our EcoCamp it’s located in a part of the junglr that is almost mosquito free. This ensures that there are fewer barriers to the natural beauty of the site. 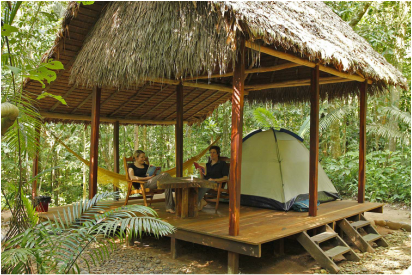 We are sure that we offer all the facilities that our guests might need in the jungle. To get more details about the installations look to the accommodation, the dining room and the cuisine.